The latest release on Stellar Fountain welcomes label artist Robert R. Hardy back to the label for a brand new single. The Hungarian artist no doubt considers the long standing Hungarian imprint one of his most comfortable homes. 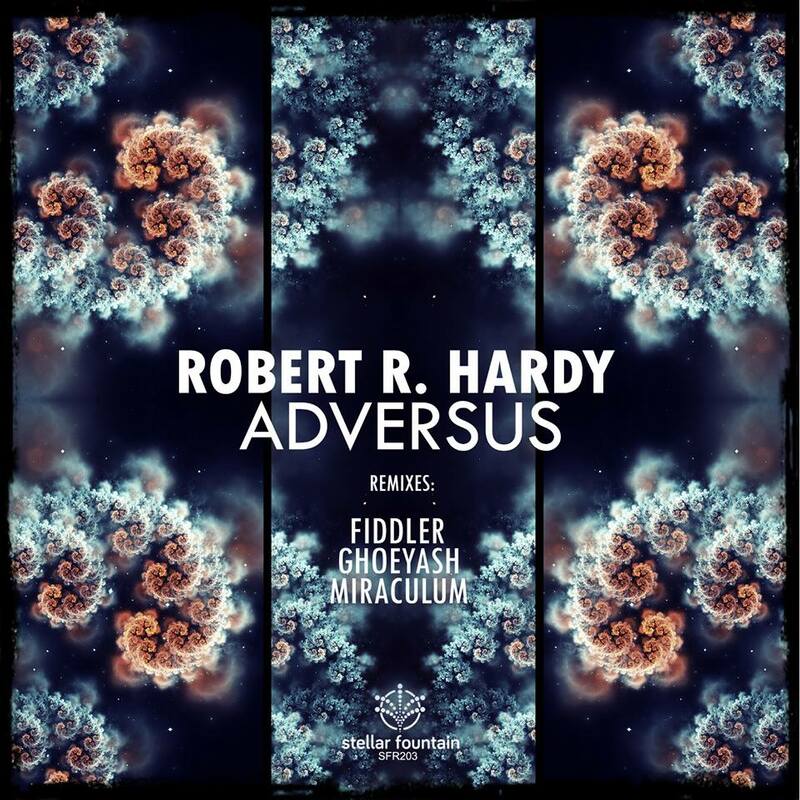 Now making his 15th appearance Robert presents his newest single ‘Adversus’ alongside remixes from Ghoeyash, MiraculuM and Fiddler. The release begins with the original mix which finds Robert going deep and ethereal. Sometimes the Hungarian artist has a dubbier or funkier sensibility about this work but this one is all about emotion. It’s tough, bouncy beats and atmospheric backdrop are immediately appealing, while a myriad of subtle motifs slowly begin to work their magic. Ethereal in design, the synth work is quite lovely, evoking a wide range of emotive qualities, which the chord changes in the bass line highlight wonderfully. It’s a magical track and probably Robert’s best melodic production to date in fact, nice to see him stretch the boundaries a few notches further here. Beautiful work. With such a great original the remixer choices are pretty tough but the label has put together a diverse group which begins with Ghoeyash’s laid back and tripped out journey. With a running time of 10 minutes the Hungarian artist works through a dreamy storyboard highlighted by a misty break and bands of trailing effects. As the second half begins there’s an extra bit of electricity in the groove which makes the psychedelic surroundings all the more enjoyable. Great remix from Ghoeyash. Next up Stellar Fountain boss MiraculuM brings his own unique approach to production and reinvents the track with a darker, more subversive sensibility. It’s the contrast in the mix which makes this so distinctive. A downright gnarly foundation sits under the ethereal synths and shimmering haze creating a very surreal audio experience. The bassy rumblings highlighting the break are almost didgeridoo like and make for a wicked stripped down beginning to the third act, before picking up intensity and carrying the main themes nicely on the road home. Great remix from MiraculuM. Closing the release out is Fiddler who is making his third appearance on Stellar Fountain and completes an all Hungarian release. Fresh off a single for 3rd Avenue Fiddler takes ‘Adversus’ into stripped back, dreamy territory. It’s a style he’s become quite known for and it certainly works well here. The punchy beats and minimalistic groove are quite refreshing and make the dreamy motifs all the more enticing. It’s a great way to round the release out and adds an entirely new dimension to the track as well. Great remix from Fiddler and a top notch offering from Stellar Fountain. Don’t miss it.